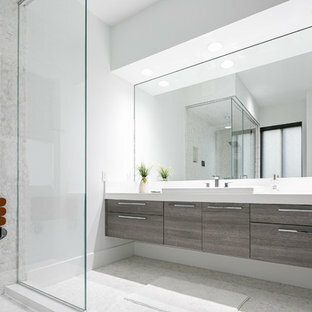 By D2 Design and Works, inc.
Open plan _ powder / shower rooms. Wooden floor look porcelain tile wall / floor. 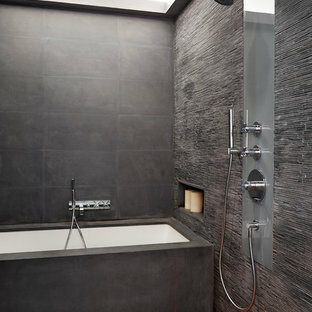 Two contemporary adjustable hand showers. White Shaker variant vanity cabinets. Caesarstone counter top / backsplash. Niche shelves ( recessed shelves). Lots of grab bars. Shower benches. Linear drain. Rain tile. This West University Master Bathroom remodel was quite the challenge. Our design team rework the walls in the space along with a structural engineer to create a more even flow. In the begging you had to walk through the study off master to get to the wet room. We recreated the space to have a unique modern look. The custom vanity is made from Tree Frog Veneers with countertops featuring a waterfall edge. We suspended overlapping circular mirrors with a tiled modular frame. 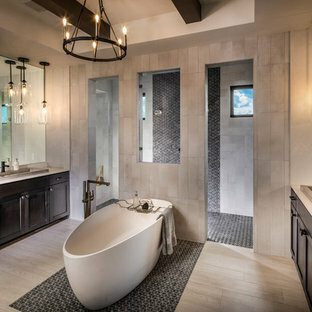 The tile is from our beloved Porcelanosa right here in Houston. 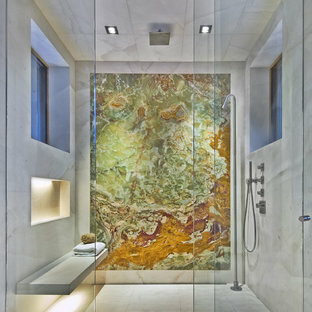 The large wall tiles completely cover the walls from floor to ceiling . 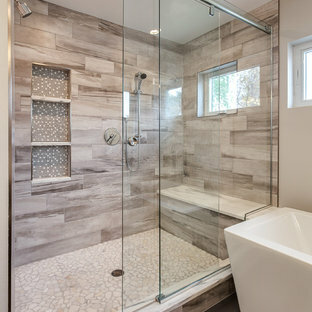 The freestanding shower/bathtub combination features a curbless shower floor along with a linear drain. We cut the wood tile down into smaller strips to give it a teak mat affect. The wet room has a wall-mount toilet with washlet. The bathroom also has other favorable features, we turned the small study off the space into a wine / coffee bar with a pull out refrigerator drawer.